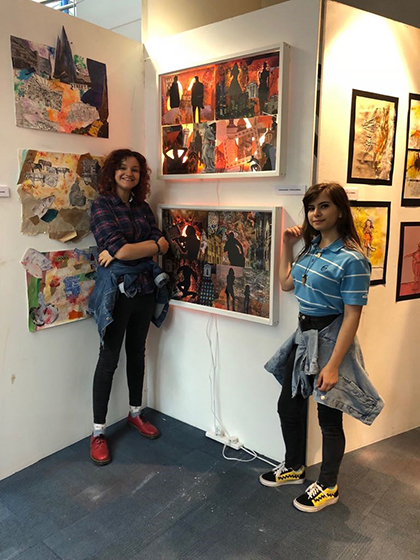 Art & Design students from The Sixth Form College, Solihull curated an exhibition of artwork at Symphony Hall in Birmingham recently. The exhibition, undertaken by first year BTEC Art & Design students, followed on from the success of a Community Art workshop with students Ninestiles School, an Academy back in March. The students curated an exhibition of the work produced from that project, accompanied by their own visual responses. They worked collaboratively, learning first-hand what it is like to put on a professional exhibition. The exhibition was displayed at the final performance of the CBSO and Ninestiles Trust project on 8 June. The BTEC Extended Diploma in Art & Design is one of four Visual Arts courses offered by the College; there are also A levels in Fine Art, Graphics and Photography.